To kick off a spirited weekend of homecoming activity, the Indiana University Bloomington Homecoming parade will take a new route this year, running north from the Indiana Memorial Union on the newly renovated Woodlawn Avenue to 17th Street. IU President Michael A. McRobbie will formally dedicate the new route at the beginning of the parade. Another highlight of the parade will be the appearance of some of IU’s Olympians. The parade will step off at 6 p.m. Friday, Oct. 14. Several notable participants and groups will appear in the parade, including Bloomington Mayor John Hamilton, former IU basketball star Kirk Haston, Distinguished Alumni Service Award recipients Chris Botti and Judge Lorna Schofield, the Bloomington High School North Cougar marching band, the Owen Valley Patriot marching band and guard, and other community and campus groups. The homecoming pep rally will follow the parade in the tailgating lots near the intersection of 17th Street and Woodlawn Avenue. The homecoming king and queen, who will each receive a $500 scholarship, will be crowned at the pep rally. A fireworks show will conclude the pep rally. During the parade, IU will also celebrate the naming of the Ray E. Cramer Marching Hundred Hall. Ray Cramer and his family will appear on a float in the parade, just behind the band as it marches down the new route on Woodlawn Avenue. Construction of the permanent practice facility for IU’s Marching Hundred, named in Cramer’s honor, will begin this fall across 17th Street from the athletics facilities and just west of the Virgil T. DeVault Alumni Center. Completion is anticipated for fall 2017. Cramer served IU and the Department of Bands for 36 years, directing the Marching Hundred for a decade and leading the department as director of bands from 1982 until his retirement in 2005. Another feature of the parade will be the return of IU’s historic and recently restored calliope, which was built for use with IU’s riverboat Majestic until it was removed in the mid-1960s and placed in a wooden circus wagon. With 32 steam-driven whistles, the calliope can be heard up to three miles away. The IU Alumni Association has purchased two custom-made floats from Indianapolis' ExpoDesign, which does many of the floats that appear in the Indy 500 parade. The IU floats will be used during homecoming and eventually will be offered for use by IU’s regional campuses. Before the parade, beginning at 5 p.m., several activities will take place at the intersection of 17th Street and Woodlawn Avenue. Food trucks, games, prizes, photo ops and more will be available until the parade works its way up Woodlawn to the review stand. The parade, pep rally and other events precede the annual homecoming football game, when the Hoosiers will face Nebraska at 3:30 p.m. Saturday, Oct. 15, in Memorial Stadium. Tickets are available through IU Athletics at 866-IUSPORTS, 812-855-4006 or iuticket@indiana.edu. Homecoming week actually gets in gear Monday, Oct. 10, with painting the campus crimson. IU schools, groups, departments and organizations will be decorating for homecoming. The IU Alumni Association will provide business locations to decorate if a spot is needed to participate. Contact Kaitlyn Cole at colekae@iu.edu for information. Festivities really swing into action on Friday, Oct. 14. In addition to the parade and pep rally, spirit stations will offer free IU swag. Locations include The Indiana Shop on Kirkwood Avenue, the Indiana Memorial Union and the DeVault Alumni Center. 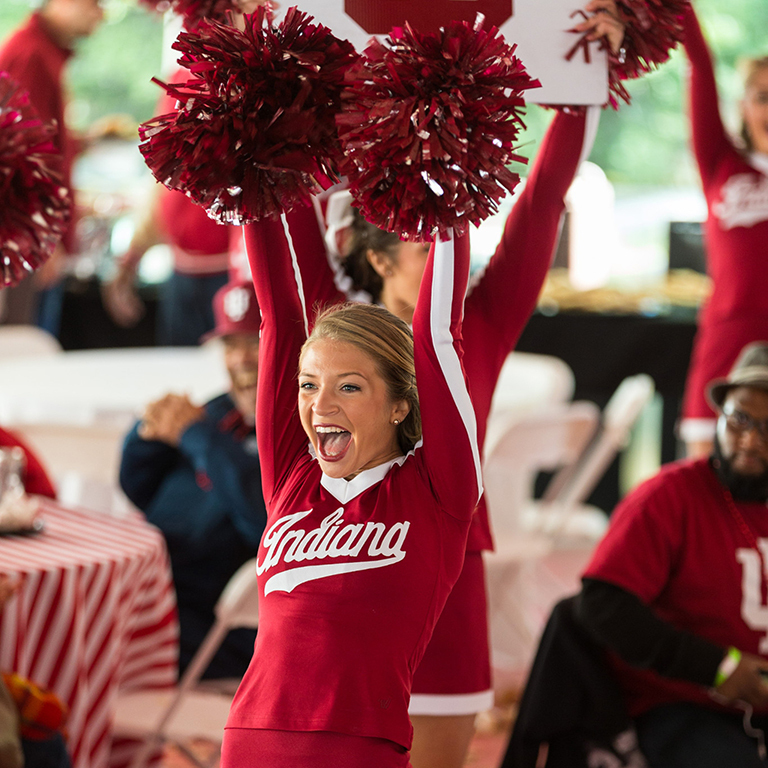 Sponsored by the Monroe County Chapter of the IU Alumni Association, the spirit stations will run from 11 a.m. to 2 p.m.
After the spirit stations, A Taste of Mini University will offer alumni a choice between two classes, each led by an IU professor from 2 to 3:30 p.m. Oct. 14. An exploration of “The Role of Sport in American Culture,” taught by professor Gary Sailes, will be at the DeVault Alumni Center. Professor Glenn Gass will discuss “50 Years Ago: Revolver and Other ‘Good Vibrations’ from 1966” in Sweeney Hall (M015), 1201 E. Third St. The cost is $5 per person. A performance by Grammy Award-winning trumpeter Chris Botti, an IU Jacobs School of Music alumnus, at 8 p.m. Oct. 15, at the IU Auditorium. The presentation by IU President Michael A. McRobbie of the Distinguished Alumni Service Award to four recipients during a dinner at the Henke Hall of Champions in the north end zone of Memorial Stadium at 7:30 p.m. Oct. 14. The recipients are Chris Botti of Encino, California; Moses Gray of Indianapolis; Richard A. Reed of Saudi Arabia; and Judge Lorna Schofield of New York City. Details and registration information and a calendar of events are available online. On Twitter, search #IUHomecoming or follow @IUAA for reminders and live updates. The IU Alumni Association is a global alumni organization that brings more than 650,000 IU graduates together to support one another and Indiana University throughout their lives. The IUAA activates IU’s powerful network through live events, webinars, scholarship programs and meaningful traditions.